*Photo courtesy of Jayson Ocampo Santos. 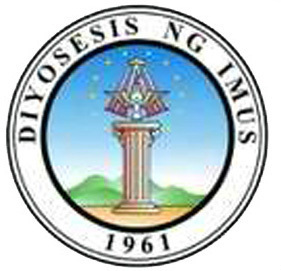 The Diocese of Imus comprises the whole province of Cavite. It was established as an independent diocese from its mother diocese, the Archdiocese of Manila by H.H Pope John XXIII on November 25, 1961 by virtue of the Apostolic Constitution “Christi Fidelium”. The Diocese was canonically erected on April 26, 1962 with the Most. Rev. Artemio Casas, DD. as its first bishop. The parish church of Ntra Sra del Pilar in Imus was chosen as the cathedral church, the seat of the new diocese. The Diocese of Imus comprise of 2,339,555 Catholics with five ecclesiastical districts, ten vicariates, forty eight parishes, nine quasi parishes and four pastoral centers. There are ninety two diocesan priests, eight religious priests and six guest priests assigned in different parishes and church institutions. Some are assigned in foreign land as chaplains of the Filipino communities or on study leave. There are two diocesan seminaries for Imus, twelve seminaries and formation houses for religious men, sixty-five religious houses for women either formation houses or houses of prayer. There are ten houses of secular institutes. There are nineteen parochial schools, twenty-five congregational schools, three Catholic colleges and one university. The Patroness of the Diocese is Nuestra Sra del Pilar whose feast is celebrated on October 12, the Nuestra Sra de la Soledad de Porta Vaga is considered as the Patroness of the Whole Province since her apparition in 1667. She has been known as “Reina de Cavite” and “La Celestial Guardiana y Protectora de la Provincia de Cavite y su Puerto”. She is presently venerated in San Roque Church in Cavite City. The National Shrine of Our Lady of La Salette is located in Biga Silang, Cavite while the Diocesan Shrine of the Immaculate Conception is in Naic. There are other centers of devotions and pilgrimages like the Sto. Nino de Ternate, Ternate, Cavite, San Agustin, Tanza, Cavite, Sta Maria Magdalena, Kawit, Cavite, San Judas Tadeo in Trece Martirez City. The Catholic faith first came to Cavite with the arrival of Don Martin de Goiti with a group of Spanish soldiers and missionaries. Among the early missionaries that came to Cavite were the Franciscans, the Jesuits, the Recollects, the Dominicans, the Augustinians and the Congregation de San Juan de Dios. The parish of San Pedro Apostol in Cavite Puerto was once part of the parish of Parañaque. Sometime between 1586 and 1591 it was established as independent parish under the mitra. It was the first parish in Cavite province and the mother parish in lowland Cavite. In the pastoral letter dated April 2, 1748 it was designated by Pope Benedict XIV as a shrine wherein one could gain plenary indulgence. The Franciscans founded the parish of the Candelaria in Silang in 1595, the first parish in upland Cavite. They also evangelized the old settlements of Indang and Maragondon. Towards the end of 1500, the Jesuits took over the former Franciscan missions and founded the parishes of Cavite Viejo (Kawit), 1624, Indang, 1625; Maragondon, 1627 and Ternate 1692. The secular clergy also founded parishes like San Roque in Cavite City, 1688; San Miguel in Bacoor 1752, San Francisco de Malabon 1753 and the Immaculate Conception in Naic 1796. The first Recollect parish, the Ntra Sra del Pilar in Imus was founded in 1795. With the expulsion of the Jesuits from the Philippines in 1768, all parishes under their administration were given to Filipino secular clergy whether criole (mestizo) or natives. Most of the early Spanish missionaries did not only minister to the spiritual needs of the people, they also helped in the founding of towns, building of roads, bridges, dams, introduction of new technology in farming, bricks and salt making and even printing. Many of them were good architects engineers and scholars. To facilitate the evangelization of the natives, the early missionaries used the reduccion system. People living in different places were resettled in one designated place within the sound of the church bell hence the term “Bajo las Campanas”. This is what is now called the poblacion of the town. Cavite Puerto, the capital of the province was an exact copy of Intramuros de Manila. It was the best example of people living “Bajo las Campanas”. Within its walls were eight churches: San Pedro the Parish Church (1586-1591); Nuestra Sra. Delos Remedios (1602); San Diego de Alcala of the Franciscans (1608); San Nicolas de Tolentino of the Recollects (1616); San Pedro Telmo of the Dominicans (1619); Nuestra sra. De Loreto of the Jesuits (1632); San Jose de Granada of the Congregacion de San Juan de Dios (1641); and the Ermita de Porta Vaga, the original shrine of the Virgen de la Soledad (1692). However the different religious orders also acquired vast tracts of land which became known as the friar haciendas. Their incomes were used for the support of their missionary activities and other houses here and in Spain. On the other hand, they modrnized farming and introduced new crops. The Recollects were the first to acquire properties in Cavite as early as 1666, they acquired the Hacienda de Sta. cruz and Bacoor as a donation from a pious lady. This came to be known as Hacienda de San Nicolas de tolentino. Other purchases were made in Imus, Binakayan, and Dasmariñas and this came to be known as Hacienda de Imus. The Jesuits used to own haciendas in Silang, Carmona, Indang and Naic. In 1720, the Augustinians acquired the Hacienda de Sta. Cruz de Malabon (Tanza) and Indang. Later in 1866 they also acquired part of the Hacienda de San Francisco de Malabon. Ligtong was owned by the Congregation de San Juan de Dios. Later, Indang and Tanza were acquired by the Dominicans in 1761. While the haciendas brought economic progress they also became instruments of oppression which led for social unrest and eventually to the Philippine Revolution of 1896. After the revolution the friar lands were gradually disposed and were bought by the American governmentand were distributed to former revolutionaries or sold to their former tenants. Cavite even in its early days of Christianization produced zealous secular clergy and religious men and women who excelled not only in holiness but also in their ministry. Among them were Fray Ignacio Gregorio de Manesay OSA, the first Filipino Chinese Mestizo missionary to China from San Roque Cavite. He was a former tiple of Don Fernando de Valenzuela, the former prime minister of Spain who was exiled in Cavite. He was ordained by Archbishop Diego Camacho and became the secretary and interpreter. Fr. Juan de Capistrano, a priest sacristan of the cathedral of Cebu known for his holiness and virtue; Fr. Juan Martin described as in “Cura parroco muy devoto”; Fr. Juan Garcia “un Cura muy intelegente y un poeta”; Fr. Miguel Robles de Cobarrubias who introduced the devotion to the Ntra Sra de Penafrancia in Naga, Nueva Caceres. In the 19th century more parishes were established in Cavite mostly established by secular clergy. Rosario 1846; Carmona 1857; Baylen 1858; Alfonso 1859; Mendez Nunez 1880; Magallanes, 1882. The barrios of San Nicolas, Ligas, Aniban, Mambog and Niog in Bacoor were organized as one parish under the patronage of Ntra Sra de las Mercedes in 1854 but it was immediately dissolved by Gov. San Manuel Pavia Marquez de Novaliches. There were two parishes founded by the Augustinian Recollects; Amadeo 1884 and Dasmarinas 1866. After the revolutions in Latin America the Spanish government became suspicious of native clergy since the Latin American revolutions were either initiated or led by native clergy. With the instigation of the religious orders, the Spanish government decreed that all parishes in Cavite administered by Filipino secular clergy should be given to the Dominicans or the Recollects. This caused the clergy of Cavite to unite and participate in the nationalistic movement of Filipino clergy to ask the Spanish government to reverse its decision to give the parishes to the religious clergy. The Nationalistic movement was headed by Frs. Pedro Pelaez and Jose Burgos. In Cavite, Fr. Mariano Gomez parish priest of Bacoor and Vicar Forane led the Caviteño Clergy in movement. Among the other nationalist priests were Frs. Manuel Trias, Esteban del Rosario, Fruto Tirona, Arcadio Resurrecion and Cornelio Ignacio who was elected president ecclesiastico of Cavite. Eventually Fr. Mariano Gomez would be executed in Luneta accused of complicity in the Cavite Mutiny of 1872. Among the Caviteno religious sisters who occupied high position in their congregations or worked as missionaries abroad were; Mother Hepolita Costelo of Cavite process of RVM (1845-1850) Mother Aniceta de la Santisima Trinidad of Imus prioress of Beaterio de San Sebastian (1845-1857); Mother Prudencia del Pilar of San Roque Cavite, prioress of the same beaterio (1893-1922). Sor Regina Samson of Tanza founded the Asilo de Santa Infrancia in Kambeo China (1890); Sor Josefa de San Andres of San Roque founded the Asilo de Santa Catalina de Amoa in 1899 and became superior of the Asilo de Santa Infrancia de Takoa in Formosa. Madre Librada Colmenar of San Francisco de Malabon and Madre Ana Bautista of Imus were pioneer Filipina Canossians in Hongkong before the outbreak of the Philippine Revolution. During the Philippine Revolution against Spain the religiosity of the Caviteno became intense even when they had to force the friars out of their hacienda and parishes. The Cavitenos fought the oppressive and racist friars but upheld their catholic faith. When friars were driven out of their parishes, the Filipino clergy who were mostly assistants of the friars took over the administration of the parishes. The laity became even devout mass goers. The Blessed Sacrament exposed in churches and devotional prayers were offered for the success of the revolution. Leaders of the revolution even served during the mass and accompanied the priest in giving communion to the sick. Officials of the Magdiwang and Magdalo faction were always present in the religious services. They even admonished the people to pray and live moral lives so that God will be at their side and they will be victorious in battles. Prayers were offered for those who perished during the battles both for Filipino and Spanish casualties. At the dawn of the 20th century all parishes in Cavite were under Filipino Priest except for Cavite Puerto which was given back to the Spanish recollects. However in 1902 the forerunner of Aglipayan sect was established in Maragondon. A few Catholic priests joined the nationalistic schismatic church. Some parishes reverted to the mother parishes and then eventually separated again. Interesting to note was the survival of some parishes in Cavite which were deprived of parish priests. Magallanes lost its parish priest after the revolution. For fifty years, the parish survived thru a lay woman who was a leader in the church. Ternate was placed under interdict for thirty years by Archbishop Jeremiah Harty. With the establishment of the Diocese of Imus, Bishop Artemio G. Casas, DD led the church of Cavite in its organizational state. He organized the diocesan curia and created new parishes. The member of Cavite clergy also increased. The second Bishop of Imus, Most Rev. Felix B. Perez a grand nephew of the painter nationalist Felix Resurrecion Hidalgo and the Revolutionary officer and classic guitarist Fernando Canon led the Church of Cavite to the implementation of the Second Vatican Council Decrees and revolutionized the Church of Cavite. He was described as a man of vision and ahead of his time. He governed the diocese with openness to changes and always trying new things. In his twenty three years as Bishop of Imus, he gave much importance through the participation of the laity, social concerns, justice and fight for human rights. He planned to call a Diocesan Synod where both the clergy and the laity would sit down for a more systematic pastoral planning that will lead the church to face the challenges of the times and be responsive to the needs of the people. However, it was during the tenure of Bishop Manuel Sobreviñas, the third Bishop of Imus where instead of a synod, the Diocesan Pastoral Assembly was held. His tenure witnessed the great migration of people to Cavite because of the concentration of factories and other industrial constitution. With the appointment of the first caviteño born bishop of Imus, the Most Rev. Luis Antonio G. Tagle, DD, the result of the assembly and the Diocesan Pastoral Planning was given more impetus. After series of meetings, consultations and planning, the Diocesan Pastoral Priorities for Evangelization was proclaimed and is now being implemented all throughout the diocese. Its primary aim is for the systematic, effective and participative ministry of the Church. Five Apostolate and twenty-two ministries are now actively being implemented in the different parishes. The church of Cavite has tried to respond to the changes of the present world in the 21st century. The Province of Cavite became a politico military province in 1614 with Cavite Puerto (formerly Tangway) as the capital. Cavite is rich in historical significance not only because of role in the Philippine Revolution of 1896 but because once its capital Cavite Puerto was the second capital of the Philippines. Cavite Puerto was for almost two hundred years, the center of the fabled Manila Galleon trade. Galleon carrying merchandise from Europe and Mexico as well as the Chinese and other Asian traders ducked in the Puerto since the sea surrounding Cavite is deeper than Manila. Because of its geographic location it has been the site of many naval battles against the Dutch, the British, the Americans and the Japanese. It has also been the site of many uprising against Spain. Many galleons as well as battleship were made in Cavite. Agricultural produce of Cavite Province were sent for the International exportation in Paris, Madrid and St. Louise in the USA. Cavite was the first province to experience military victory against Spain and the first to be liberated from the Spanish yoke. In Cavite the Philippine flag was first unfurled and the Philippine National Anthem was composed. It was the first seat of the Philippine Revolutionary government. It was in this province where Gen. Emilio Aguinaldo the first President of the Philippine proclaimed the Philippine Independent on June 12, 1898. The Province is named after the shape of the two old native settlements along the coastal area of Manila Bay- Kawit (Cavite Viejo) and Tangway (Cavite Puerto), that of a hook. Another old tradition says that when the Spaniards first landed in present town of Kawit they found a gathering people watching the crabs hook at each other’s. The Spaniards asked for the name of the place and the natives not understanding a Spanish word thought that they were asking about what they were watching at. They responded “Kawit e” meaning the crabs are hooked at each other. Since “w” is uncommonly used in Spanish words the Spaniards pronounced “w” as “v” and they exclaimed “ah Cavite” thinking that it was the name of the place. Kawit came to be known as cavite Viejo while Tangway which means “tip of the loop” became known as Cavite Puerto. Geographically located at the mouth of Manila Bay, Cavite was once called ‘la llave de Manila’ (the key to Manila). It is bounded on northwest by the Bay, on the northeast by the provinces of Rizal and laguna, on the southwest, the province of Batangas. It’s present capital is Trece Martires City. Early in the American era, two US military installation were established in Cavite; the 29th Engineer which later became the Cavite Philippine Naval base in Fort San Felipe and the US Naval Station in Sangley Point in Caňacao. The Caňacao Radio Station was build in Cavite in 1914 with its three wireless radio tower hovering over the present Cavite City and the nearby towns. In 1936 the first Pam Air clipper the first American commercial airline with the fast cast landed in its Clipper Station in Cavite. The Second World War destroyed the capital of the province because of the heavy bombardment both of Japanese and America military forces. What was once the exact copy of Intramuros de Manila was razed to the ground. Because the US and the Philippines mutual defense agreement the US Naval station in Sangley Point Cavite City remained long after the country was granted its independence in 1946. The US Naval base was turned over to the Philippine government in 1971. Thus ending the more than fifty years of American presence in Cavite. Topographically Cavite is divided into upland and lowland areas. Coffee, coconut ,vegetables and fruits were the main products in the upland area while rice was major crop in the lowland. Fishing and salt making are other major industries taking into accounts its coastal waters. Cavite is famous for its wide variety of native “kakanin” like bibingka, tilbok, maja blanca, bibingkoy, tamales, kasilyo, tinapa, and other Philippine adaptation of Spanish cuisine. Tagalog is the language spoken all over the province though there are pockets of chabacano speaking in Ternate and Cavite City. Chabacano a mixture of Tagalog and Spanish which was a product of Caviteňo ingenuity in Communication. Today Cavite is witnessing a radical and massive urbanization because of its proximity to Manila and its inclusion in the Calabarzon factories and estates, subdivisions, golf courses, resorts, export processing zone (EPZA) have sprung in the province. Massive migration to Cavite has increased the number of population greatly causing heavy traffic jam and other social problems. Tagaytay with its cool climate, scenic view of Taal lake and Taal Volcano, numerous retreat and seminar houses, restaurants and hotels draws many tourist each year. Most Rev. Artemio G. Casas, D.D. Most Reverend Felix P. Perez, D.D. Most Rev.Luis Antonio G.Tagle,DD, S.T.D.